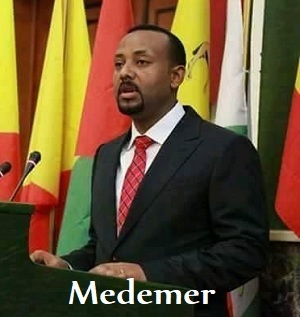 April 2, 2019 (Ezega.com) -- This week marks one year since Dr Abiy Ahmed was elected Prime Minister of Ethiopia. Many news outlets are covering the occasion with a mix of praise and grave concern. No Ethiopian leader in recent history has generated so much hope and enthusiasm as Abiy Ahmed. Following his inaugural speech, the country was awash with what some called "Abiymania." Such was the positive reception, that some even called him the 'miracle leader' sent from god. And, early on, he did not disappoint. Soon after he took power, he unleashed a series of measures in successive order that no leader could have done from within the EPRDF (Ethiopian People's Revolutionary Democratic Front). He released all political prisoners, some on death row. He invited all exiled opposition forces to come home, some who were armed. He liberalized the political space in the country, including for media and civil societies. He appointed many women to high profile positions within his government. He broke the deadlock with Eritrea and signed a series of peace agreements, exchanged embassies, and opened the borders. He went into extensive discussions to form what some call a 'free economic zone' in the horn of Africa. He strengthened relations with the Middle East, and even received loans and investments. More importantly, he brought so much hope to many, that, Ethiopians can unite and create wonders. According to Human Rights Watch (HRW), "His charismatic style appealed to individuals from across Ethiopia’s many ethnic and political divides, no mean feat in Ethiopia. It was a remarkable turnaround that followed several years of protests and excessive force by security forces that left over 1000 people dead." However, Abiy's one year is not all the glory that people hoped and prayed for. In fact, now, many are profoundly disillusioned. At the end of one year, the country is mired in deep insecurity. There are many parts in the country where law and order has broken down. The economy is in decline. The ruling party, EPRDF, is no more the coherent self it once was. In fact, many say, it exists in name only. Although many political prisoners were released, some say, they are replaced by others who are jailed selectively, based on their ethnicity and political affiliations, while others equally guilty or worse are overlooked. Some regions, such as Tigray, are asserting more autonomy, to the extent of ignoring arrest warrants from central authority. Border tensions are increasing, the most notable (and potentially very consequential) being between Tigray and Amhara regions. "A proliferation of firearms and entrenched positions from regional government officials over contested borders have exacerbated rising tensions," says the HRW report. At least ten ethnic groups in the Southern Nations, Nationalities and Peoples’ Region (SNNPR) have petitioned to form their own states, leading to the possible breakup of SNNPR and increasing tensions in some areas there. During Abiy's watch, the country became home to the highest number of internally displaced people in the world. More than a million are still outside their homes. Says the HRW: "As political space opened, Ethiopians were finally able to voice historic grievances that they bottled up for decades under an authoritarian government. Many of these grievances are related to access to land and complex questions of identity and governance. Many of these grievances are related to access to land and complex questions of identity and governance. Many Ethiopians have settled these scores, often along ethnic lines, including by forcibly displacing people from land or engaging in violent conflict with rival groups. This has occurred across many parts of the country amidst a serious security breakdown and a vacuum in local governance." Addis Ababa is at the center of controversy as to who owns the city-state. The Oromo regional government has shown its intention to assert more control on the city, a move which has angered so many Ethiopian and led to a series of demonstrations, some of many likely to come in near future. In the middle of this, the Ethiopian people are very confused as to what to expect next. Many fear for their beloved country, its unity and stability. The Ethiopian people hoped to continue the relative peace and stability they once enjoyed, but with more freedom and democracy. They seem to be getting neither. With this backdrop, the euphoria over Abiy’s initial reforms is fading fast. Many are now wondering whether the young Ethiopian leader can put back the country together and achieve a stable, united and freer Ethiopia, and with continued economic development that was once the envy of the world. So far, the task ahead seems to be too daunting for Abiy (or for any leader, for that matter). But much of the country hopes and prays that he succeeds.